Primary liver and bile duct cancers are the sixth most common cause of cancer death in men and the tenth most common cause of cancer death in women . Hepatitis B and C viral infections have been identified as causative factors in greater than 75% of liver cancers worldwide . Interestingly, incidence rates are low in most developed countries except for Japan, where coffee drinking is relatively uncommon. Several studies have also identified an inverse association between coffee consumption and serum levels of gamma-glutamyltransferase (GGT), an enzyme involved in glutathione metabolism [4-5]. Glutathione plays important roles in antioxidant defense, nutrient defense and regulation of a variety of cellular events . Residents of Finland consume more coffee per capita than the Japanese, Americans, Italians and other Europeans. University of Helsinki researchers examined the associations between coffee consumption and serum GGT levels in 60,323 Finnish participants between the ages of 25 and 74 who were cancer-free at the beginning of the study. During a median follow-up period of 19.3 years, 128 participants were diagnosed with primary liver cancer. The researchers observed that the cumulative incidence curve of liver cancer decreased with increasing amounts of daily coffee consumption (graph). When the analysis was restricted to surveys from participants that had clinical data available, a statistically positive association was found between serum GGT level and liver cancer risk. 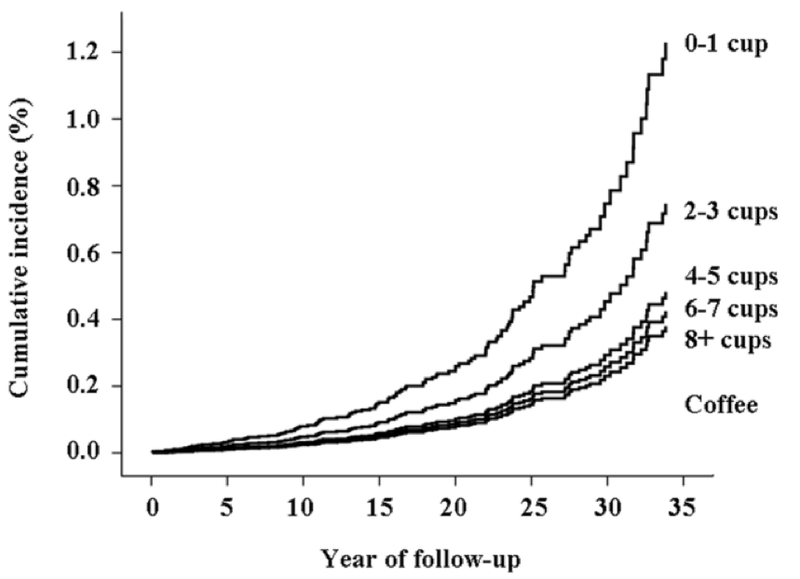 Joint association of coffee consumption and serum GGT level with liver cancer showed that participants who drank 0 — 1 cups of coffee and were in the top 25% of subjects sampled with respect to serum GGT had about 9.2 times increased risk for liver cancer compared to participants who drank at least 6 cups of coffee daily and were in the bottom 75% of subjects sampled with respect to serum GGT. Several other putative mechanisms behind the association of coffee drinking and serum GGT on liver cancer risk have also been proposed. Coffee contains many compounds, such as chlorogenic acid, which may have the potential to influence glucose metabolism processes to prevent hyperglycemia, and consequently oxidative stress. 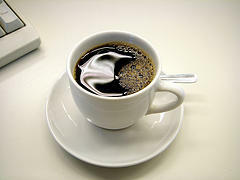 Indeed, chlorogenic acid, a chemical largely responsible for coffee’s bitterness, may also be responsible for coffee’s effect on serum GGT level and, ultimately, coffee’s health benefits. More information and support for patients with “Liver cancer” can be found at Organized Wisdom and MDJunction. Additionally, the American Liver Foundation, the nation’s leading nonprofit organization promoting liver disease prevention and liver wellness, provides research, education and advocacy for those affected by liver-related diseases. A Snapshot of Liver and Bile Duct Cancers. American Cancer Society. Atlanta, Ga. 2007. Ferlay et al. GLOBOCAN 2002: Cancer Incidence, Mortality and Prevalence Worldwide. IARC CancerBase No. 5. version 2.0. Lyon, France: International Agency for Cancer Research; 2004. Casiglia et al. Unexpected effects of coffee consumption on liver enzymes. Eur J Epidemiol 1993;9:293-297. Tanaka et al. Coffee consumption and decreased serum gamma-glutamyltransferase and aminotransferase activities among male alcohol drinkers. Int J Epidemiol 1998;27:438-443.24. Wu et al. Glutathione metabolism and its implications for health. J Nutr. 2004 Mar;134(3):489-92. Larsson and Wolk. Coffee consumption and risk of liver cancer: a meta-analysis. Gastroenterology. 2007 May;132(5):1740-5. Epub 2007 Mar 24. Bravi et al. Coffee drinking and hepatocellular carcinoma risk: a meta-analysis. Hepatology. 2007 Aug;46(2):430-5.